Photograph; a black and white, landscape-oriented photograph mounted onto a dark card backing. 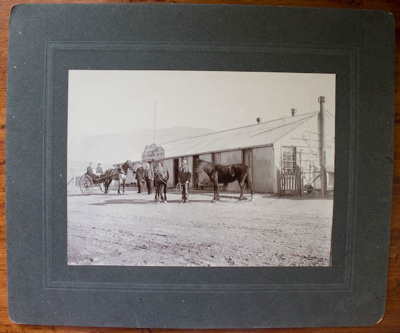 The photograph depicts the Bannockburn Hotel, a long, corrugated iron building. The shingle road is visible in the foreground. Outside the building are two horses held by a central man; to his left are two women and a child in a gig drawn by a single horse, whose nose is held by a man. The name plate of the Bannockburn Hotel is painted above one of the doors. Hills are visible in the distance. Stamped onto the bottom right hand corner of the mount is G A Tomlinson / CHRISTCHURCH. 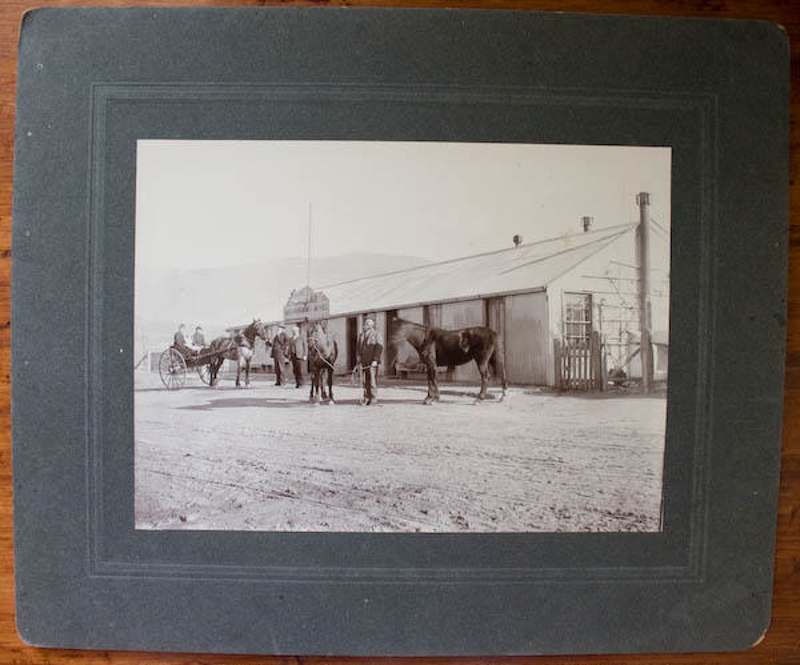 In a modern hand on the reverse is written 'Bannockburn Hotel / Donald McRae / Holding horses at right / Mrs McRae in buggy on left'. Gold was first discovered at Bannockburn, a small settlement to the west of Ophir, in the spring of 1862. By November of that year there were approximately 2000 miners active in the area. Amenities such as hotels, a school, a church, and a general store were established to service the growing population. For more information about Ophir Post Office, which is cared for by the New Zealand Historic Places Trust Pouhere Taonga, visit our website.